Ferentaria has as its central part photographs taken by six children, from Ferentari district of Bucharest, during the photography course led by Ioana Moldovan photographer at Alternative Education Club. Exhibition offers children from Ferentari the possibility to disclose to the public their own vision of life in the ghetto by an artistic approach and aims to change negative attitudes against Roma. Photos will be exhibited from August 1 to 7, between 1:00 p.m. to 8:00 p.m. in GrădinAcuarela. 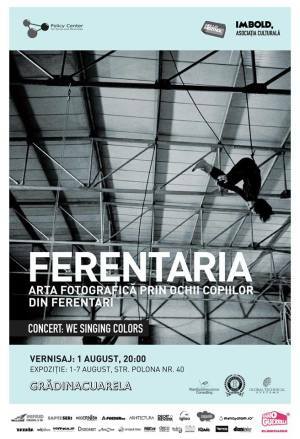 "Ferentaria - photographic art through the eyes of children" Art Show in Bucharest. You can get here description, reviews, address, time and details of "Ferentaria - photographic art through the eyes of children" Art Show in Bucharest. Visit Bucharest Tips for more Art Show events in Bucharest!